The wildfires that are roaring through northern California are already “among the most destructive fire events in U.S. history”, and by the time it is all said and done this could be the worst wildfire season in the history of the state. So far, fires have scorched more than 250 square miles, and more than 3,500 homes and businesses have already been destroyed. The official death toll has risen to 21, but that is expected to rise dramatically because over 600 missing persons reports have been filed with authorities. The worst damage has been done in Napa and Sonoma counties, and you can see some deeply troubling photos of the devastation here and here. The weather forecast is not looking good for those living in wine country, and for those firefighters trying to get a handle on the 22 wildfires raging through Northern California, which broke out Sunday and are barely contained more than three days later. The National Weather Service issued a red flag warning for the North and East bays starting at 5 p.m. Wednesday and midnight on Thursday respectively. That means winds can gust from 20 mph to 50 mph in the higher elevation areas, fanning the flames down mountains and into the cities. So as bad as things are at this moment, the truth is that they are going to get even worse over the next 24 hours. The California Department of Forestry and Fire Protection said fire activity increased significantly, destroying more buildings and forcing more mandatory evacuations. The wind-whipped, fast moving cluster of blazes ranks among the most destructive fire events in U.S. history. Of course this crisis comes on the heels of several other major disasters. In recent weeks our nation has had to deal with Hurricane Harvey, Hurricane Irma and the Las Vegas shooting, and many have pointed out that the U.S. has not seen a series of disastrous events such as this in a very long time. What would you do if your home burned to the ground? Perhaps you could use the insurance money to rebuild eventually, but what would you do in the meanwhile? Soot readings in many areas have reached levels considered very unhealthy or hazardous, air quality regulators said. And the economic damage that is being done by these fires is going to be felt for many, many years to come. Wine industry experts say that even if a winery’s vineyards remain standing, they face steep challenges as their employees struggle with burned or damaged homes. The region counts wine and tourism as top employers, and many workers who pick grapes or work in hotels may be compelled to relocate after losing everything. Napa and Sonoma counties are home to around 900 wineries (of 4,600 statewide), with most boutique businesses making higher-end wines. The two counties represent 13% of the state’s output. And the state itself supplies 85% of the nation’s wine production, making it the fourth-largest producer of wines after Italy, France and Spain. Expect the price of wine to go up substantially in the months ahead, and this is going to be a huge hit for one of the most economically prosperous areas of the state. Many of the facilities that have been destroyed will never be rebuilt, and needless to say the tourism industry in northern California will not be the same for a very long time. Please pray for the people living in northern California. Normally, it is one of the most beautiful areas on the entire planet, but now it is literally being transformed into a complete and total nightmare. 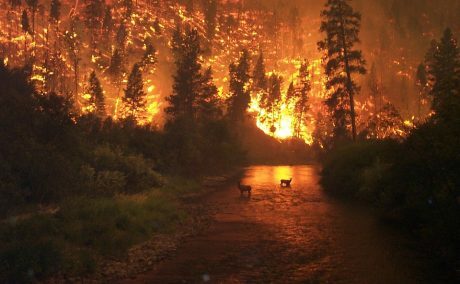 For years, I have been writing about the alarming increase in the intensity of wildfires all over the country. One of the big reasons for this is the fact that the federal government is not properly managing the lands under their control, and so wildfires tend to burn more rapidly on federally-owned lands. It is time for the federal government to start turning over ownership of these lands to the states, and that is something that I plan to fight very hard to accomplish.